Wash and slice the cucumbers, slice the onions and capsicums. Combine the vegetables in one or two very large bowls, sprinkle with the salt (do this in layers as you are adding the veggies) and add the cold water (you will need more than nine cups!) Let stand for 3 hours then drain without rinsing. In a large saucepan combine the remaining ingredients. Heat to boiling, then add the vegetables. Bring back to the boiling point but do not boil. 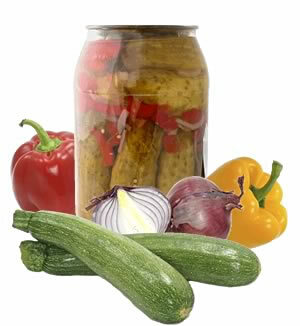 Pack into hot sterilized jars and seal Chill before serving. Very good on bread and butter, but serve with cheese and cold meats, too. Makes about 6 litres of pickles. I guess you should process these in hot water for about 10 minutes … but I never have.